Every Thanksgiving, as long as I remember, we spent either having guests or being invited to someone’s else home. After all, this is the Holiday to celebrate the sharing with others. But we didn’t do that this year. This year we had Thanksgiving at home. Three of us, Robert, Jan, and I. Amanda is still in France. Holidays were always difficult. For different reasons. That was the time when I missed my parents most. That was the time when I felt more than ever how Robert differed from his cousins, as if he were moving on a completely different orbit, belonging to another planet. As Thanksgiving was approaching, I was rather cheerless. I had an underlying impression of not belonging anywhere because I was not being able to forge connections strong and meaningful enough to provide a pleasant and enriching holiday experience for… Robert. As turkey was being roasted, Jan took Robert for a short walk and to a movie theater. And then we sat down to eat. Turkey, beets, Brussels sprout, stuffing, bean salad, and a few other dishes for Jan and myself. Chicken fingers, baked potato with cheese, and arugula for Robert. Three of us together. It was not a sad or lonely experience. To the contrary. It was a warm and fulfilling time. We were together. We talked a little, we laughed a little. Jan and I shared my first apple pie in15 years. Robert ate cookies we baked together. We all drank tea after dinner looking at each other, smiling, and chatting as much as Robert could muster. It was surprisingly a wonderful and relaxing Holiday. And then I realized that the thing that I missed most on those other Holidays was… Robert. When we had quests, or when we were invited, Robert seemed to be separated from us more than on any other day. I realized that as much as I like company of others, I do tend neglect Robert when the guests come. He seems lost and moves chaotically not sure where he belongs and what should he do. I don’t help him. Maybe because I am too busy talking to others, maybe because I don’t know how to help him. It might be that what bothered me most during those other Holidays was that I lost connection… with Robert. Of course, that is the Holiday’s conundrum. You should celebrate the closeness of your family and its openness to others. You should nurture your inner relations of your family circle and you should cultivate and enforce the ties that connect your family with friends and distant relatives. During my childhood in Poland, it was easy to manage those contradictory undercurrents of celebrating. We had two days of holidays for Christmas and for Easter. One day we spent in a close family circle, the second day was for going out and/or inviting others. Here in America, I always spent holidays as f it was that second day and never as it was the first. It was American Holiday of Thanksgiving that allowed me to understand that. The title is not appropriate. As of now, I didn’t discover any rules that would govern Robert’s overnight stay outside the house. During our last trip, as well as during our previous trips, Robert accepted all kinds of sleeping arrangements. Of course, he preferred hotels with swimming pools, but didn’t complain about hotels without them. 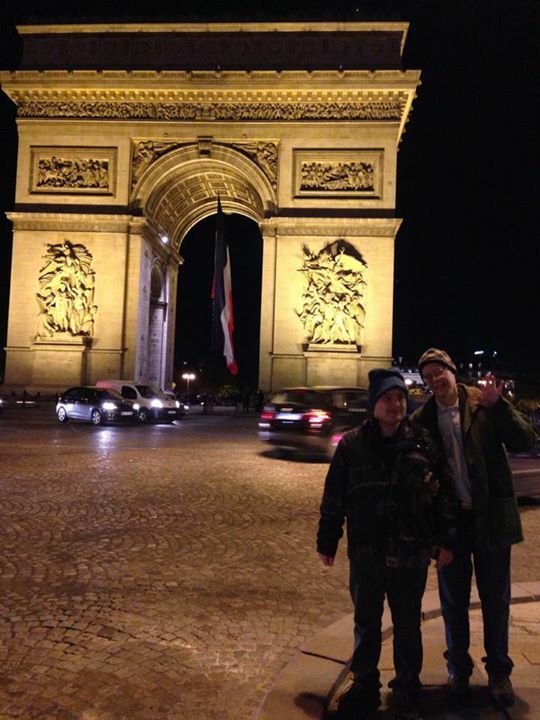 During our trip to France and Poland, we stayed in different hotels, a cottage, a bed and breakfast, and with a family. If Robert found any of them more or less comfortable than the others, he didn’t share that observation with any of us. He was a relatively gracious guest in any place he entered. Sadly, Robert was not a very gracious host, when his aunt and uncle came for a two day long visit. Don’t get me wrong. He loves his aunt and uncle. When he heard that they were coming, he worked diligently with me on cleaning the house. The house, after our trip to Europe, was in a rather bad shape. Robert vacuumed, brushed toilets, washed sinks, carried garbage out, and kept doing laundry of all the needed bedding. He accepted, ahead of time, the fact that he needed to give the guests his spare comforter and that I would do the same. However, he didn’t assent to giving them a spare queen sheet set as he considered it belonging to my bed. He offered other sheets: blue, white, and purple Unfortunately, they were all twin sizes Reluctantly, he acquiesced, but the pain of doing something that went against HIS unspoken rules of the house, bothered him for all two days and thus he bothered us also. I consider it a great achievement on his part, that he waited until our guests’ day of departure to remove the sheets, wash them, fold the sofa, and enjoy the return of the previous order. The other issue arose, when Robert wanted to go to bed. Our rather pleasant routine came to bite us when the circumstances changed. Every night, when Robert is ready for a bed, he expects us, his parents, to be in our bed too. His father can keep working on his laptop. I can watch Netflix on my IPAD. But we have to stay in bed. The matter of fact, Robert brings me IPAD and places a glass of water on my nightstand. Only when everything is ready for his parents to take a rest, Robert goes to his bedroom. Well, on Thursday evening, Robert wanted to go to bed earlier than usual. Probably, because he was tired. That meant that his parents should go to bed too instead of entertaining themselves and their guests. Moreover, my other friends arrived, as they usually do, around 8 PM. It never was the problem in the past, but this time Robert really wanted to go to bed early. As we were drinking tea, wine, and eating a pie, Robert kept coming over to remind me, “Mama bathtub, mama bathtub.” Which meant, “Take a shower and go to your bed.” Over and over. He was also looking for any empty cup, goblet, or saucer to pick it up and carry it to the kitchen sink. Robert deduced that if there were no dishes, there would not be any temptation to eat or drink more. So some guest would leave and some would go to sleep. We responded to Robert’s removing empty dishes by keeping always something on the plates and something in the cups or goblets. I also asked Robert to do small jobs around the house – empty a dishwasher, fold the last basket of laundry hoping that this way, I can gain a few minutes without hearing, “Mama bathtub, mama bathtub.” Robert complied but soon was back with more, “Mama bathtub, mama bathtub.” To make his request clearer, he brought my night-gown. I gave up. Since I noticed that the guests were having very nice time talking, and knowing that Robert’s aunt could easily replace me in the role of the hostess, I withdrew to my bedroom. Robert brought me a glass of water and IPAD and went to his bedroom. Robert’s dad, by the way, was already asleep with his laptop still on. After a break, we returned to studying together. Robert has less time now, as since the beginning of November, he goes to his Program four times a week. If you add swimming, horse riding, and one evening socializing with a friend, that doesn’t leave much time for studying. Still, if he doesn’t study, he doesn’t do anything at all in his “free” time. Robert’s fascination with Netflix, somehow evaporated. Moreover, now, when he goes out a lot with his Program, he notices the importance of learning. At least learning some of the things that might be useful. 1. A lot of language exercises. Of course, pronunciation. I used two books to guide me through the process: Becoming Verbal and Intelligible and Functional Language Walc 6. I know that exercises in both books should be presented by speech pathologists. The only thing I can do, is to type the words on Speak It APPs on IPAD, listen and repeat. And that is what we are doing. I don’t believe I am helping a lot, but this is better than nothing. 2.Walc 6 Functional Language by Leslie Bilik Thompson addresses many other aspects of language development. Sadly, Robert needs all of them. “Yes and no” answers, guessing what the characters are saying in simple drawings, following directions, concepts related to time and space, and so much more. The thing that bothers me is the fact that this book just like almost all other related to language do not sufficiently address lack of speech initiation. More teaching how to answer questions than how to ask them. And almost no room for spontaneous commenting. 3. 150 What’s Wrong With This Picture? Scenes provides opportunity for unprompted talking. I simply open the book, and wait for Robert to point and name things that are wrong. After he uses one or two words to say what is wrong, I confirm his response by using a full sentence. 4. We have returned to Talking in Sentences and Teaching Kids of All Ages to Ask Questions. But at this time I changed approach a little. For instance I ask only one question and wait for the answer, and then ask Robert to tell me about what he sees or deduces from the drawings. That extends Robert’s speech production and forces him to use his own tools to go on without being “helped” or “interrupted” by my questions. The second book I also use as a model to help Robert ask questions that relate to his surroundings and his experiences. Yet, I wouldn’t know what to do, if I didn’t work with those books before. 5. We go on with Reasoning and Writing Part B. Yesterday, we finished lesson 38. Last few lessons offer the opportunity to work on understanding issues related to pronouns in written texts. Through the funny story of a writer, Mrs. Hudson, and an illustrator, Zelda, Robert learned what problems could arise with understanding of the sentences when pronouns could point in two different directions. For instance we could end up with children playing in the mud while the pigs are watching instead of other way around. The last few lessons also address geographical directions. Those Robert knows well, but it is still good to him to practice where one character is in RELATION to another. Robert does well there. And of course, there is a little more writing. The program offers a template sentence and then with the help of bank of picture-words Robert can make concrete sentences. For instance, based on a sentence: “Someone is eating something.” Robert can write many other sentences by substituting words “something” and “someone” with appropriate nouns. 6. We still do math, but mostly we review, reteach, and relearn old concepts. This time we support ourselves with Standard edition of Fourth Grade Singapore Math. 7. Results for Adults Cognition is a new book I am using to address old problems in a new way. I only use a part of each unit, and not everything even in that part. Again, I am still figuring out ways to use this book in a way that would be relatively simple for Robert. There is a lot about short memory exercises. For instance remembering the name of the person in the picture. I know that if I would say that name only once, Robert would repeat it, but forgot it a few minutes later. So after I present the name and Robert repeats it, I am asking another question about that person, for instance “Who is standing next to the wall?”. Then every minute (that seems to be a very long time) I ask similar question about the same person. As, I said, we just began working with that book, which luckily has many good topics related to a real life and that seems to be what Robert likes. I was afraid of our trip to Poland even more than I dreaded visit to France. Thirteen years have passed since our last family trip to Poland. Thirteen years ago, my mother was alive. Her husband was alive. We could stay in their house. Robert was 9 years old, and still relatively small. Amanda, 11 years old at that time, was already a great role model for Robert and thus a great help. We, the parents, were not 50 years old yet. We weren’t rich, but we weren’t as financially stressed, as we are now. I knew that people usually look differently at 22 years old, big man with autism than they look at 11 years old boy, small for his age. Yes, I was afraid how Robert would feel and behave in homes of his relatives, and his parents’ friends. But to some degree, I could predict possible problems a new environment might cause. What I couldn’t predict was how other people would treat Robert. Moreover, I couldn’t predict how I would feel and react in response to their attitudes toward Robert. When Ewa B. welcomed us at the Katowice Airport inviting us for a breakfast, I was both deeply touched and petrified. It was such a great feeling to still have someone waiting for us, many years after our last trip and yet I was afraid how Robert would behave, and how he will be treated. I tried to decline the invitation, but Ewa’s will was stronger than mine. Four of us, Robert, Amanda, Jan, and I, came for a wonderful breakfast. The best cheeses, one of a kind hot sausages, fresh bread, and strong coffee. For Robert there were his favorite crackers, as in new places he usually sticks to his comfort food. As we ate and talked I felt my reserve melting, my fears evaporating. Robert was welcomed as much as we all were. And he knew that. He behaved appropriately despite not understanding the language we were using. At some point, Robert wanted to leave. He calmly, in his own wordless way, began to clean up the table of already emptied plates and cups. We didn’t mind that as our stomachs were full and we had a long way ahead of us. After that first visit came many others. We met our relatives and friends many times during this trip. We visited their houses, met with them at hotels and at restaurants. Many people didn’t know English and yet talked to Robert. Although he didn’t understand the words coming from the foreign language, he felt what they were saying because he responded with smiles. After returning from Europe two weeks ago, I wrote only about our trip to Versailles and our gaffes at the airport security for which Robert paid the price. Those were difficult times for Robert and thus for me too. Robert’s reactions, although to some degree predictable, resulted from his specific understanding of rules, and his lack of ability to communicate efficiently under stress. With some reluctance, I have to say, that those reaction were disability related. 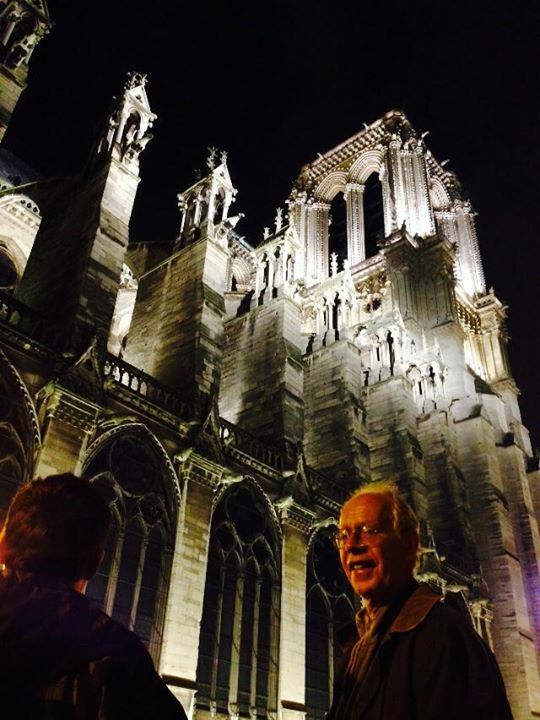 I haven’t written about our evening walks along Seine River to Notre Dame and back to Gare de Lyon. I haven’t written about Robert’s walk from L’arc de Triumphe to Eiffel Tower which included a few rides on merry go round. I haven’t written about Beauvais Cathedral or the cathedral in Bayeau. I didn’t write about night walk to Mont Saint Michel and another one we took the following morning not before we bought two umbrellas. Up and down the stairs to and through the Monastery. 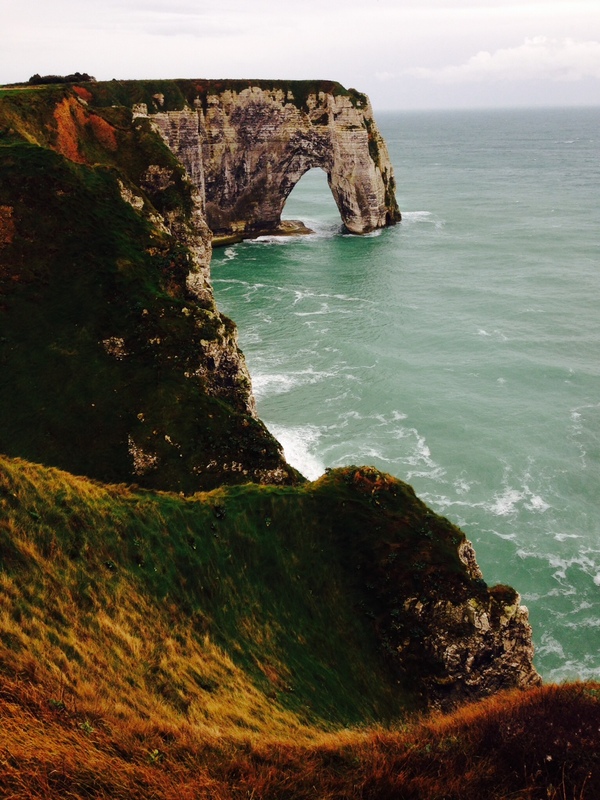 I haven’t written about climbing Cliffs in Etretat or stopping at Granville to look at the Ocean. I haven’t written, because Robert was doing exactly what everybody else in our group was doing. Walking up and down through the Monastery, looking at never-ending cathedral ceilings, rosettes, and tall, colorful windows, one above the other. I didn’t write about Robert, because I did not pay any special attention to him. He didn’t need our attention. He let us see for ourselves and he was seeing everything for himself. He was engrossed in the changing surroundings the same way, each of us was. I didn’t notice any idiosyncrasies that would make Robert’s reactions different from ours. I also refrained from directing Robert’s attention toward specific objects. I am not sure there was a need to do just that. Robert had a right to absorb everything in his own way. And so he did. It was a beautiful trip, almost magical. We all felt that. Robert didn’t mind being squeezed at the back of the car with his sister and me, while Alain or Robert’s dad drove for hours. Robert somehow knew that at the end of the trip there would be something to see and the hotel to sleep in. And that hotel might even have a swimming pool. The picture of Robert taken in the Chateau de Versailles shows a person who finds this new experience clearly enjoyable. Except this is not how I recall Robert’s visit to the Chateau. As we walked from one room to another, surrounded by a huge crowd, I remember Robert repeating, “Airplane, airplane.” or “Applebee’s, Applebee’s”. I interpreted those callings as a wish to return home and to find a good place to eat. Robert, in my opinion, felt overwhelmed by the slowly moving crowd, blocking the most interesting views. He was also very disappointed with French cuisine, that left his food untouched on the plate and his stomach empty. I have to say, I didn’t expect that reaction. After all, a year or so ago, we visited a few large mansions in Newport, RI and Robert seemed to like those visits a lot. But then, those mansions were not crowded to the point that limited the view. The impression one might form while entering spacious, tall, richly decorated, airy spaces was gone when those spaces were filled with people. It was hard to direct one’s attention from backs of the people in front to anything in the chambres. But I tried. -Applebee’s next week in Boston. We are in Versailles now. We see paintings on the ceiling. Painting on the wall. Huge mirrors. Great chandeliers! -Paintings, mirrors, lamps- Repeated Robert as I kept pointing. This sort of a dialogue repeated itself ten or more times with small adjustments taking into account presence of sculptures, canopies over beds and so on. Only when we stopped to sit on sparsely placed benches by the windows, Robert was able to take a bigger breath and look contemplatively at what was in front of him. So was I and so was Jan. We all kept quiet for a change letting our eyes do the wandering. As soon as we got up Robert began, “Airplane, airplane.” And I followed until the exit. We didn’t see everything. I regret that. I do think that despite all his anxiety, Robert deserved to see more. I believe, that under different circumstances he would enjoy and learn a lot more in a calm, relaxed manner so well projected in his picture. Luckily the following day, we found two important places in the close proximity of our hotel. One was Subway Restaurant where Robert ordered his foot long, toasted, Italian bread with cheese and pepperoni. The other was a laundromat where Robert washed our dirty clothes diligently separating white clothes from dark ones. That was something he was familiar with. From that point on he could stay in France, specially since the hotel had a nice swimming pool too. It had to be said, that all the commotion at the airport was not Robert’s fault, but mine and my husband. It was Jan who forgot to take his belt with a metal buckle and his knee brace with a metal insert. Thus had to go three times through the security scanner. That event was not lost on Robert as he probably deduced that going back and forth through the security gate could be done freely. It was I, who didn’t take IPAD from the backpack and thus the IPAD and backpack had to go through the scanner again. Robert was not prepared for such development and ran back to retrieve both. Consequently, he had to go through the security gate again and then again as he had already his wallet in his packet. He didn’t want to part second time with the wallet, that was not what he did during any of the previous trips. It was not Robert’s fault that I had a metal container with cards from Super Duper School Company in my bag, which I didn’t take out and thus had to open the suitcase, which again distressed Robert. It was Jan, who ten minutes before our turn to enter the plane decided to buy candies for Robert and disappeared somewhere in the terminal causing Robert’s anxiety. That anxiety, calling rather loud, “dad, dad”,might have alerted security and cause additional pat down. The event, I have to say, Robert tolerated patiently and calmly. Three days after our return home, I am still not able to put our experiences in perspective. Four airports and four planes. I did not ask for assistance with Robert. I thought that our previous two airplane trips to California proved that Robert could manage going through security without really alerting anybody to his special needs. While going through Security at Logan Airport in Boston was not a problem, the small airport in Beauvais, France was a completely different story. Everything started well. Robert went through the scanner gate without a problem. Unfortunately, when the security personnel returned our green backpack for another screening as I forgot to remove Ipad from it, Robert ran back to retrieve it. I had to run after him knowing that nobody else would convince him to leave the bag for another screening. Reluctantly, he let the bag and the Ipad go through, but then he had to go through the gate again. Except he had his wallet already in his packet. So he had to leave the wallet. That seemed wrong to him, after all he did that before. He took the wallet out, but didn’t want to leave it. I don’t remember how I convinced him to place the wallet in the bin again. But he did and he went through the scanner himself. I went after him. He calmed down when everything was in front of him. First he got his wallet, then jacket. he took upon himself to place Ipad in my bag. He gathered all bins and placed them in the pile. I learned my lesson and in the next airport in Katowice, I remove my Ipad promptly. There was a problem with my small suitcase as it contained a metal box with a set of cards from Super Duper School Company, but Robert didn’t mind me opening that bag as he didn’t care too much for its content. Back at the Charles De Gaul Airport, for reasons that are completely mystifying to me, Robert was singled out for another pat down just before entering airport. He took it with stoic attitude. I didn’t. I was wondering what in Robert’s behavior could provoke that additional scrutiny. And the only thing that come to mind was Robert repeating “dad, dad” over and over when his dad disappeared for a few minutes to buy him candies. Robert was anxious, very anxious. I was mad that Jan chose this moment to look for candies and risking being late for boarding. Anyway, Robert’s repeating, “Dad, dad”, didn’t seem a good reason for an additional scrutiny. But maybe anything that seems out of ordinary is a reason for a scrutiny. Maybe in other countries, the airports’ employees are less familiar with travelers with autism. After thinking it over, I am glad that I did not ask for assistance. At least I could find out what are the possible problems and, in case, we travel again, prepare Robert for them. I don’t regret not asking for assistance. I am not sure I would get an appropriate one. As for airplanes, only during the first take off, Robert got scared. He held my hand and requested, “Home, home.” In a few second he relaxed. Maybe because the plane lower the angle of flight, maybe because the perspective of sleeping in a hotel with a swimming pool was worth a short period of discomfort.